Can I use vinyl sulphone as an acid dye on silk with citric acid for immersion dyeing? Message: Can I use vinyl sulphone as an acid dye on silk using 1 TBL citric acid when immersion dyeing in 3.5 gallons of water? Slowly heating to 185°F and holding for 60 minutes, then slowly cooling. Yes, this looks like a recipe that should work. You might want to use more citric acid, though. Oddly, in this recipe, a vinyl sulfone dye may act as a true fiber reactive dye on silk, unlike other types of fiber reactive dyes, which act only as acid dyes when applied at acid pHs. You might get a combination of acid-dye-type bonding and fiber-reactive-type bonding. PRO Chemical and Dye provides a similar recipe for immersion dyeing wool with vinyl sulfone dyes, combining 2.5 gallons of water with two tablespoons (or 35 grams) of citric acid, and simmering (about 185 degrees F, or 85 degrees C) for between 30 and 60 minutes. You’re using more water and less citric acid than their recipe. Their recipes for immersion dyeing silk with these same dyes calls for a high pH, instead, with sodium carbonate or potassium carbonate instead of the acid, but, since it is a protein fiber, silk can also accept dye using recipes intended for wool. Dyeing silk at a low (acidic) pH will tend to preserve its luster and stiffness better than dyeing it at a high (basic) pH. The difference between acting as an acid dye and acting as a fiber reactive dye lies in how the dye becomes attaches to the fiber. An acid dye is attached to a protein fiber by means of a combination of hydrogen bonding and salt linkages. A fiber reactive dye, in contrast, is attached by a true covalent chemical bond, making the dye and fiber molecules into a single molecule, firmly bound together. The advantage of the fiber reactive type of bond is that is it much more permanent, and cannot be washed out with hot water, unlike acid dyes. See “What kinds of chemical bonds attach dyes to fibers?”. The vinyl sulfone dyes, also known as Remazol dyes after the brand name under which they were first introduced, contain a masking group of atoms in the dye molecule; this masking group prevents the dye from reacting with the dye water, thus giving the dyes a longer life when dissolved in water, and its slow removal in a hot dyebath helps wool to dye more levelly (producing a more perfectly solid color) than it would if all of the dye were immediately able to react with the wool. There are two different ways to remove the masking group: one, which works very quickly and without high heat, is to produce a high pH with a chemical such as sodium carbonate (soda ash). Surprisingly, the other is to heat the dye in the presence of a mild acid, such as citric acid. The ideal pH for the removal of the masking group is between 5 and 6, which is only mildly acid. This takes some time, but an hour should be plenty of time for it. A note on spelling, for anyone curious as to why sometimes “sulfone” appears spelled with a “ph”, and sometimes with an “f”….The main reason why we see the spelling “vinyl sulphone” is that Jacquard Products sells a brand of vinyl sulfone dyes which they name “Vinyl Sulphon”, the intentionally odd spelling, along with the capital letters, serving to distinguish it from the generic name for the vinyl sulfone dyes. The generic name is sulfone, rather than sulphone, as decreed by IUPAC, the international federation of chemists which sets standards in chemistry nomenclature; a sulfone is a chemical compound containing a sulfonyl functional group (a sulfur attached with double bonds to two oxygen atoms), in which the sulfur is also attached to two carbon atoms. The element sulfur was often spelled “sulphur” in British writings starting in the eighteenth century and continuing until 2000, when the Royal Society of Chemists in Britain agreed to standardize to the IUPAC spelling; interestingly, sulfur had been the original spelling even in British usage. The letter combination “ph” typically indicates that a word was originally sourced from Greek, but the origin of the word “sulfur” is Arabic, not Greek. This entry was posted in dyeing silk, immersion dyeing, Remazol dye on September 24, 2014 by pburch. Is it possible to reuse Procion dye vats, to reduce salt disposal? Message: I am planning on dyeing a lot of yarn (5/2, 8/2, and 10/2 warp twist cotton, in 1/2 lb hanks) a wide range of colors for weaving purposes. I’m shooting for a range of 45-60 individual shades. I’m planning on using Procion dyes, and I’m wondering if there is a way around using all the salt that would be required for 45-60 individual vats. If I am dying several shades of the same color, could I reuse the dye vat? Meaning, load the tub with water and salt, add the amount of dye needed for the color intensity I’m shooting for, add the yarn, when the dye is exhausted, remove the yarn, add dye again for a stronger intensity, add yarn, etc. Also, how would you recommend I handle adding the pH up if I do this? Any suggestions would be helpful: If I end up dumping 150ish cups of salt into my septic tank, I’ll kill it, ditto if I pour out in the garden, etc. My first suggestion would be to use small-volume dyebaths. Dyeing with a small volume of water requires far less salt, and can even be done with no salt at all. This method of dyeing, called low water immersion dyeing, or LWI, is the easiest dye method of all, and, since it does not require salt, produces far less difficulty when it comes time for disposal. (See my page, “How to Do Low Water Immersion Dyeing“.) You can use just barely enough water to cover the material you are dyeing, and, with the smaller water volume, you do not need as much dye per pound of fiber. With such a low volume of water, salt is not required to drive the dye into the fiber to avoid wasting dye, which is its main purpose in a large-volume dyebath. In fact, the purpose of salt in LWI, when it is used at all, is to increase the complex patterning of the different colors used in one small dyebath. However, low water immersion dying is not suitable when you want perfectly solid colors. LWI produces a mottled effect, often with a lot of color variegation. The results can be more beautiful than solid colors, but of course there are many applications which absolutely require a single solid color for each batch. For the rest of this answer, I will concentrate on high water ratio immersion dyeing for solid color dyeing, which requires twenty or twenty-five times as much water as dyeable material, by weight. Procion dye does not exhaust on cotton the way that acid dyes exhaust on wool. After you have used a dyebath with acid dyes for wool, most of the dye will be absorbed into the wool, leaving the dyebath noticeably lighter in color. This does not happen when you are dyeing cotton. After you have used a fiber reactive dyebath, there is a lot of non-reactive hydrolyzed dye left in the water, as the result of the reaction of some of the fresh dye with the water. Depending on how long you allow for the dye reaction, and how warm your dyebath is, there will also be active dye remaining, ready to dye the next piece of yarn that gets into the dyebath. This means that you cannot simply reuse a cotton dyebath in the way that you can reuse a wool dyebath, with relatively little effect on the color of the next dyebath. However, if reproducibility is not a high priority, with careful planning you can reuse a Procion dyebath by starting with a pale hue, then adding more dye to it to make a more intense hue that is not hurt by contamination with the first dye color, or by starting with one color and then adding increasing amounts of one or more colors to make a mixed color. I do not recommend reusing dyebaths if your goal is to produce the exact same colors as a previous time or the next time that you dye. If your goal is only to make a great many different beautiful colors, you can reuse dyebaths, as long as you don’t find the washout of the larger amounts of unattached hydrolyzed dye that you get this way to be a problem. After dyeing one hank of cotton and removing it to wash, some of the dye will be in the cotton, some will still be in the water but hydrolyzed so it cannot react again, and some will still be active and ready to go, to form a permanent bond to the next batch of yarn, if you use it right away. If you wait until the following day, nearly all of the dye will have hydrolyzed, by reacting with the water, so that almost none will remain to bond to the fiber in the next round of dyeing, though the hydrolyzed dye will temporarily stain the cotton. The dye reacts with the water much more quickly if the temperature of the dyebath is higher. All or most of the hydrolyzed dye that is absorbed into the fiber can be removed by washing, since it cannot react with the cotton to form a permanent bond. The procedure is to first rinse the cotton with cool water, to remove salt, soda ash, and much of the loose dye, then to wash as many times as needed in very very hot water, to remove the rest of the unbonded dye. Synthrapol is popular among dyers for washout, and it is a good detergent for this purpose, but the real magic lies in the temperature of the wash water. Even without the chemical bonding of fiber reactive dye to fiber, the hydrolyzed dye has a tendency to associate with the fiber, by the dye property called substantivity, which is the same property that causes all-purpose dyes to attach to cotton in a far less permanent fashion than fiber reactive dyes; water at a high temperature must be used in order to decrease the substantivity of the dye, so that it will wash out. Wash water should be at least 140°F (60°C), but it works even better at nearly boiling temperatures, and it also works better if the fiber is allowed to soak in it for a while. The bond between the cotton fiber and the Procion dye is so strong that it will remain firm even if you boil the dyed yarn. It is important to remove the unattached hydrolyzed dye, because otherwise it will wash out gradually in the laundry, giving the impression of non-washfast dye, and possibly transferring the unattached dye to other pieces, especially when damp, causing unwanted dye stains. It’s a good idea to add the water softening chemical, sodium hexametaphosphate (also known as Metaphos or as Calgon T), to both your dyebath and to your wash water, to prevent hard-water minerals from forming chemical complexes with hydrolyzed dye that are particularly difficult to wash out. When reusing a dyebath, you always go from a lighter color to a darker one. For example, if you want a number of different shades of blue, let’s say that you start with a 1000-gram hank of fiber (I’m choosing this weight to make the calculations simple, but just multiply each of these dye amounts by 0.227 to get the amount for 8 ounces, which is 227 grams). It is typical to double the strength of a dyebath for each increment of color intensity, when dyeing a gradation. So, for an extremely pale color, you could dye this to a 0.3% depth of shade (DOS), by using 3 grams of dye. When reusing the dyebath, you could then aim at a DOS of 0.6%, by adding 6 grams of dye (without being sure how much of the original dye remains active, which could make it darker). For the third reuse of the dyebath, you could aim for a DOS of 1.25%, by adding 12 grams of dye, then for a fourth use you could aim at a DOS of 2.5%, by adding 25 grams of dye. Finally, for a pretty dark DOS of 5%, you would add 50 grams of dye, for dyeing a 1000-gram quantity of yarn. (For dyeing eight-ounce hanks of yarn, these amounts of dye calculate out to be 0.7 grams, 1.4 grams, 2.8 grams, 5.6 grams, and 11 grams.) If you do this whole progression, you will end up with a lot of hydrolyzed dye in your used dyebath, as much as if you were preparing a single dyebath of dark black, which is sometimes used in depths of shade of up to 10%, but you will save a considerable amount of salt. The stock solution method also makes it easier to mix dye colors. Instead of adding a certain volume of one color of stock solution, you can add half as much of each of two colors, for example turquoise plus fuchsia to make purple. To make in-between colors, it is easy to use more of one color than another; for example, you might use 20 milliliters of fuchsia plus 5 milliliters of turquoise to make a true blue. 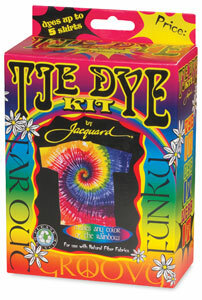 For more ideas for mixing colors, see my page, “How can I mix Procion MX dyes to get specific colors?“. Another advantage of working with stock solutions is that you don’t have to wear a respirator when measuring dye in liquid form. You should always wear a well-fitting respirator or dust mask while working with dry dye powder, to prevent allergies. When reproducibility is not a priority, though, and if they are not preparing a large number of dyebaths, many dyers find it easier to use small measuring spoons. One teaspoon of dye equals 5 milliliters, which, depending on the dye color and dye batch, will usually contain between 2 and 5 grams of dye. Assume an average weight of 2.5 grams or dye per teaspoon, for the sake of rough conversions. Keep in mind that some colors are much more dense than others, so you can’t expect a gram of lemon yellow, say, to have as much effect in your color mixing as a gram of navy. This entry was posted in dyeing cotton, immersion dyeing, Procion MX dye on July 25, 2014 by pburch.